Topics: Preowned Cars, How To Find Us, and Wheel Alignment. Its 2 nameservers are ns2.domaincityservers.com, and ns1.domaincityservers.com. 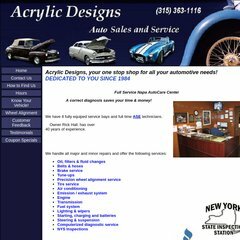 Acrylicdesignsauto.com's IP address is 69.90.45.71.